Greater Philadelphia Bicycle News: 5PM ON MLK Drive - START YOUR ENGINES! 5PM ON MLK Drive - START YOUR ENGINES! BCGP Board Member and Advocacy Chair Kyle Gradinger took this telling shot of a Dodge Hemi at the front of the queue waiting for the PPD to wave the checkered flag on MLK Drive at 5PM. 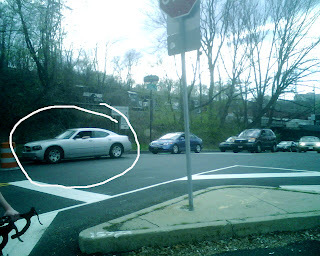 Apparently some local muscle car enthusiasts have realized that this park road is theoretically free and clear of traffic (and hopefully children on bikes) immediately after the Great Unwashed are herded back on to the MLK Sidepath. And with 1.8 miles of open road to the Montgomery Drive light the average NASCAR wannabee should enjoy a full 80 seconds of super-charged adreneline.